Have you ever seen a potty trained rooster? I mean literally a rooster that goes potty on the toilet! Could this be true? If it is every body with a house pet chicken will be trying to potty train their bird. Watch our featured video: Potty Trained Rooster. We are so proud of Jet Li the potty trained rooster from Becky's Homestead. 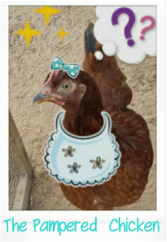 Check out a potty trained hen, chicken intelligence, and pampered chickens! You won't believe it til you see it? Well here it is. We are so excited about a potty trained rooster. If this rooster is actually potty trained, more house pet chickens can be trained to use the potty rather than wear chicken diapers. To be sure we will try to potty train a rooster and get it on video ourselves so we can have positive proof. From the way Jet Li's video looks, it's true roosters can be potty trained. Check out a Potty Trained Hen! Check Out What Pampered House Pets Are Getting Now! ​From chicken diapers, to hen saddles, sweaters, to swings, harnesses, treats, coops and more. These house pet chickens are spoiled rotten! Mark 3:35-For whosoever shall do the will of God, the same is my brother, and my sister, and mother.